Exterior painting is a job that requires you do everything by the book. Your home's paint plays a vital role in protecting it from the elements, so doing a cut rate job means you're effectively putting your home at risk. By following the basic guide below, you can be certain that your exterior painting project will hold up in good fashion for years to come. It's impossible to emphasize this point enough. When it comes to paint, a thorough preparation of the surface to be painted is absolutely essential. Skipping the prep means you can be almost certain that your exterior house painting project is going to fail you somewhere down the line. Keeping that in mind, be sure to check and see if any of the following preparations are necessary before your exterior painting project really gets rolling. Clean your home before painting. The easiest way to get this done is to rent a pressure washer from an equipment rental company or have it done professionally for a price. This is one of the most important things you can do, since dirt and dust prevent paint from adhering to your home's surface. Use a wire brush to remove loose paint. If you've got paint that has blistered, cracked or is peeling off, be sure to run over those areas with a wire brush to remove any loose paint. A good pressure washer will get some of this grunt work done for you, but you'll still need to give a little personal attention to worse off areas before you get rolling. Fill in cracks and holes with a paintable caulk or putty. By attending to this chore before you start slapping on the paint, you'll drastically reduce the number of areas on your home's exterior where water and other weather can penetrate and cause damage. Apply primer to all exposed wood. Once you've cleaned and scraped your home, you're sure to have some bare spots of wood glaring out at you. Make sure to hit these spots with a good coat of primer before you start applying the final coats of your exterior house painting. Once you've properly prepped your surface to be painted, you're ready to do the painting itself. Start by brushing the trim, since you want to avoid having to lean ladders against freshly painted siding, and tape the trim off once you're finished and it's had time to dry. The next step is to rent or purchase a sprayer for the rest of the job. These pressurized wonders will substantially reduce the time it takes you to get your exterior painting finished. They might feel awkward at first, but once you get the hang of it, you're on your way. A few quick suggestions: 1) two light coats are much better than trying to apply a single heavy one (otherwise you'll end up with drips and runs galore), and 2) beware of overspray. Your neighbor isn't going to care how good your home looks if his new, black pickup truck is suddenly a cute, speckled pink because you didn't take the wind into account before you got started. Enjoy Your Home's New Look! Once you finish up, step back and enjoy the good looks of your finished exterior painting handiwork. Of course, if you're not up to taking on the major responsibility of painting your home on your own, talk to a painting contractor about doing the work for you. Painters are experienced, skilled, and have the equipment and crews to finish in a day or two what might take three or four weekends to get done. Call a painting contractor today for a stress-free exterior paint job that you can enjoy for years to come. Matt Goering, formerly a carpenter and house painter, is a freelance writer for the home improvement industry who has published over 600 articles. 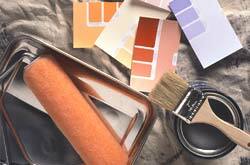 Should You Hire a Painting Contractor?